The French radioactive waste disposal organization, Andra, on 12 July published its triennial national inventory of radioactive materials and waste. France has generated 85,000 cubic metres of nuclear waste since the last inventory. Andra reports that there was 1.54m cubic metres of radioactive waste in France at the end of 2016 – an increase of 85,000 cubic metres since the last inventory, which was based on data from the end of 2013. "The rate of waste generated between two inventories has changed little since we did this exercise," said Soraya Thabet, director of environmental safety and sector strategy at Andra. It even decreased compared with the period between the end of 2010 and the end of 2013, during which 140,000 cubic metres of radioactive waste had been produced. Some 60% of the waste is from the nuclear fleet, 27% from research and 9% from defence, with the remainder coming from other industries (such as electronics using rare earths) and from the medical sector. Low or medium-level waste accounts for 90% and only 3% are high-activity or long-lived wastes but these are responsible for 99.8% of the total radioactivity. Andra developed several scenarios for the future. In one, the 58 reactors currently in operation are shut down after 40 years of operation (and the Flamanville EPR, which will enter service in 2019, after 60 years), without any replacement of the nuclear fleet. In the other scenarios, the reactors are operated for 50 or 60 years, in line with EDF’s plans, and are then replaced by EPRs. In any case, the volume of radioactive waste will continue to grow. By the time the current fleet stops operating and is dismantled, it will have increased threefold or fourfold, depending on the scenarios, without taking into account research and defence wastes. This increase in inventory will be due mainly to the very low-level waste that will be generated by decommissioning nuclear plants. This includes concrete, rubble, scrap metal, However, closing the reactors after 40 years would see the end used fuel recycling through mox fuel use sooner which means 57,000 used fuel assemblies that would otherwise have been recycled, would be added to other wastes. Whatever the scenario, new storage sites will be needed in the short or medium term. High-level, long-lived waste (reprocessing residues, fuel assembly hulls, effluents, etc.) 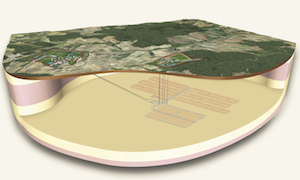 is destined for the future Industrial Geological Storage Centre (Cigeo) planned for Bure, in the Meuse. Andra plans to apply for authorisation to construct Cigeo in 2019 for commissioning to 2026, but it faces strong opposition. Wastes with low or medium-term short-term activity (clothing, tools, filters), will be sent to the Soulaines-Dhuys (Aube) site with a capacity of 1m cubic metres. Materials of very low activity have since 2003 been sent to Morvilliers (Aube), which has a capacity of 650,000 cubic metres and which will be full, by 2025 or 2030. Long-lived low-level waste (more than 300 years) will be generated by decommissioning six first generation former graphite-gas reactors (Bugey 1, Chinon A1, A2 and A3, and Saint-Laurent A1 and A2). There is still no storage for this waste, which Andra plans eventually to store at Soulaines-Dhuys.